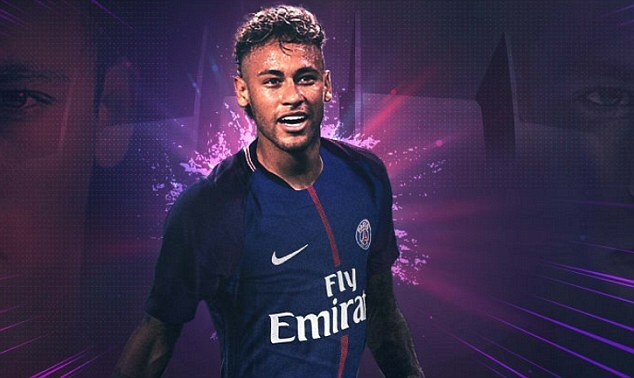 Neymar has finally completed his world record £198m transfer to Paris Saint-Germain from Barcelona. After weeks of intense speculation regarding the deal, the 25-year-old has signed a five-year contract worth £500,000 a week with the French side and is in line to make his debut on August 5 at home to Amiens in Ligue 1. Neymar, who will be officially unveiled on Friday afternoon, said: ‘Since I arrived in Europe, the club has always been one of the most competitive and most ambitious. ‘And the biggest challenge, what most motivated me to join my new teammates is to help the club to conquer the titles that their fans want. ‘Paris Saint-Germain’s ambition attracted me to the club, along with the passion and the energy this brings. PSG president Nasser Al-Khelaifi added: ‘It is with immense joy and pride that we welcome Neymar to Paris Saint-Germain. ‘His winning mentality, strength of character and sense of leadership have made him into a great player. ‘He will bring a very positive energy to this club. In six years, we have built a very ambitious project that has already taken us to the highest level of national and European football. For Barcelona, Neymar’s exit is a significant blow so close to the start of the La Liga season. It dismantles their three-pronged attack with used to comprise of the Brazilian, Lionel Messi and Luis Suarez. They have been strongly linked with a move for Liverpool attacker Philippe Coutinho as Ernesto Valverde looks to reshape his side ahead of his first season as the Nou Camp boss.